Right on to what I'm up to. I've not managed to do a great deal of knitting this past few days. 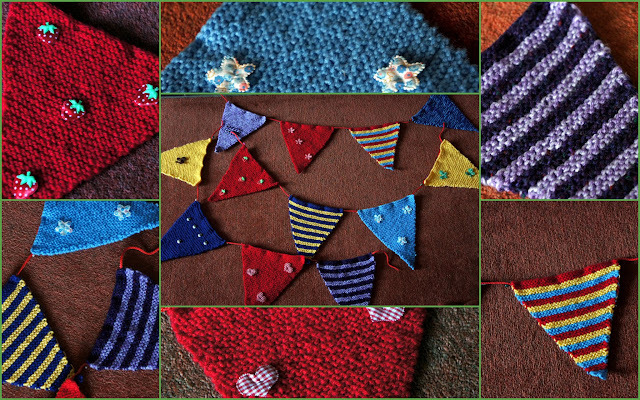 The bunting is more or less finished, pinned but not sewn on yet. Other than that its been painting the interior of the playhouse. The flooring is down, a number and alphabet frieze pinned up. The 'R' pennant is ADORABLE! It's so cute, and very official, that he has a flag for his clubhouse! Oh wow, love these! Such an adorable way of using up scrap yarn. My favorites are the stripy ones! Those pennants looks great ad the bunting will be fabulous! R for Rufus. Excellent. Your bunting and pennant are a joy. We thought of making bunting in the Fusion sessions but the time factor was against us. The samples used finger knitted cords, which the young people love to make with gusto. You may notice that I am commenting on your posts in reverse order. Trying to go back to 25th March and I can't get the hang of the new Blog system. I've worked out how to go backwards but not how to get from 25th March back to today. Must be old age.